Although NASA scientists quickly determined that the face was created by tricks of light and shadows, the imaginative public seized on the idea that it did not form naturally. Some people believe that the face is the remnant of an alien civilization, suggesting that other rocky outcroppings in the area may be a crumbling extraterrestrial city. 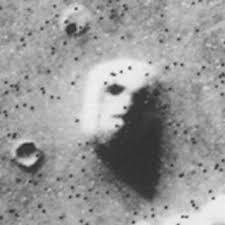 Since 1976, the face has appeared in a number of popular culture references citing it as an indication of life on Mars at some stage of the planet’s history. Books, movies and television have all taken part in speculation on the “true” origin of the Martian rubble. 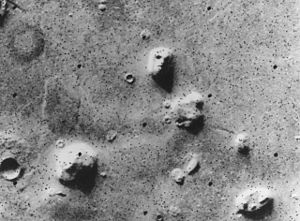 In April 1998, NASA’s Mars Global Surveyor took more detailed images of the face. Other high resolution images subsequently taken by the Mars Reconnaissance Orbiter and the European Space Agency’s Mars Express revealed that original analysis of the images was correct; the suggestion of a face is an optical illusion revealed only as the light hits the surface and wells of the rocks at specific angles.